The GMO: Green Marvellous Opulence project follows in the wake of the established and recognizable creative manner by this Franco-Greek tandem. They used recycled pieces of plastic to create a series of light object that resemble heads of lettuce or cabbage. 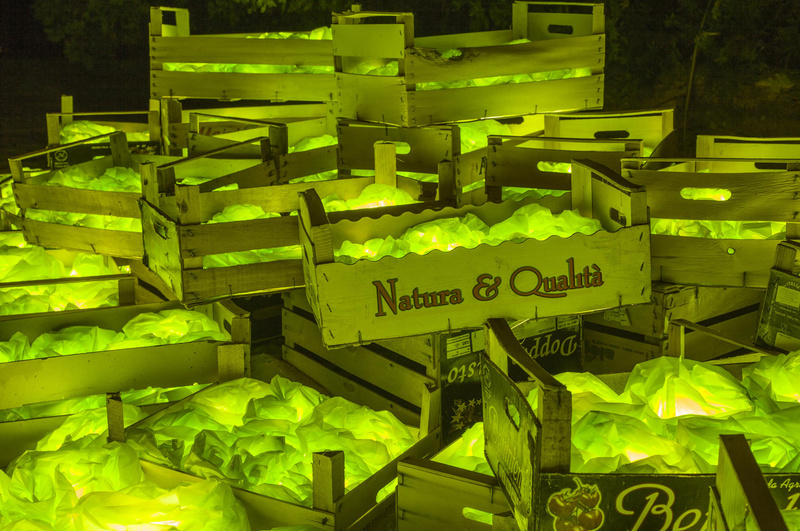 The highlighted colour of these artificial foodstuffs – since they actually glow in the dark in night-time – is a wittingly humorous take on the problem of mass production of food and of genetically modified plants that increasingly more jeopardize the traditional methods of food production. From the indicator of ecological production, the bright green colour of the produce turns into a sign of non-natural, artificial; as a warning against the practices that, following the effort for the increase of prosperity and food supply, can end up in the dangerous field of the unknown. Maro Avrabou (1960, Athens, Greece) is a lighting designer for theatre, dance and opera performances, while Dimitri Xenakis (1964) works as a sculptor, photographer and curator. They, as a tandem who lives and works in France, have created numerous projects that use light to explore different aspects of attitude towards life. Their field of activity surpasses the widely established notion of artistic installation as it leads them to explore further and discover new aspects of the urban and natural landscape. The hosting of the artists is co-financed by the French Institute Slovenia.